In the mid to late seventies the disco era was booming and it’s one genre that is still very active especially as most of the dance-based chart songs in the last 20 years are based on disco in one form or another. 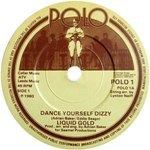 There was also cheesy disco which still works well at parties and weddings, songs like D.I.S.C.O., Y.M.C.A and this week’s subject, Dance Yourself Dizzy by Liquid Gold. Back in the early seventies a rock band from Hatfield called Babe Ruth had a cult following and had reasonable chart success in the US, but by the time their fourth album, Kid’s Stuff in 1976 was being recorded, there were tensions and various members had left. Two people who independently auditioned, Ray Knott and Ellie Hope, made their mark and were recruited and appeared on the aforementioned album, but it was unsuccessful and both Ellie and Ray left soon after. Ellie was no stranger to the music business as she had been a backing singer for Mud and being lead guitarist Rob Davis’ sister-in-law got the job of providing the narrative on their 1975 chart-topper, Oh Boy. She also released a couple of solo singles including Tip of My Tongue and My Love Is Your Love, the latter of which was written by Mud’s Ray Stiles and Rob Davis. After leaving Babe Ruth, Ray and Ellie recruited guitarist Syd Twynham and drummer Wally Rothe and formed a new band called Dream Coupe. They began writing their own material and playing in local bars performing both their own songs and some cover versions. Within a few weeks they were spotted by Adrian Baker who was the resident producer at Creole records who had them signed to its subsidiary label Polo and changed their name to Liquid Gold. Their first single was Anyway You Do It which was co-written by Baker and the Rubettes original lead singer Paul Da Vinci and peaked at number 41 during Christmas 1978. In America club DJ’s had picked up on the B-side; My Baby’s Baby and was receiving nightclub exposure on the East coast. Parachute Records, which was a subsidiary of Casablanca, bought the US rights to the song and asked Joe Long & Richie Rivera to give it a much-needed remix. The song rocketed to number five on Billboard’s club charts and number 45 on the singles charts in the summer of 1979. Over there they were still an anonymous group and no one knew what they looked like, but they figured they were a black group judging it on Ellie’s voice so tried to book them for the legendary show Soul Train, but for reasons unknown it never happened and thus pretty much ended their US career. Back in England, their next single, Mr Groovy was released in May 1979 but failed to get noticed. Then Baker teamed up with the songwriter Eddie Seago who had written songs like Early In The Morning (Vanity Fare), I Ain’t Got Time Anymore (Cliff Richard), Another Time Another Place (Engelbert Humperdinck) and most famously Y Viva Espana for Sylvia and they came up with the ultra-catchy Dance Yourself Dizzy. It was released in February 1980 and peaked at number two in April behind The Jam’s Going Underground. Their next hit, The Night, The Wine and the Roses stalled at number 32 and then came Don’t Panic, penned by Baker and was entered for the Song For Europe to represent the UK at Eurovision but was beaten by Bucks Fizz who eventually won that year with Making your Mind Up. In 1982 they changed song writer and enlisted the talent of Mickie Most’s brother, Dave and his writing partner Glen Burns who together with producer Steve Glen co-wrote Where Did We Go Wrong. And that’s probably a question they asked themselves at that time as that song stiffed at number 56 and was the last time Liquid Gold graced the UK chart. In 1983 both Twynham and Rothe left the band. The remaining pair released one further single, What’s She Got which went nowhere and so they called it a day. Ellie and Ray married and having been running the One-Off’s pine furniture shop in Reigate since 1991. In 1999 Dance Yourself Dizzy got a new lease of life when Yomanda sampled it in their number eight hit Synth and Strings.